What does a nation owe its citizens with respect to health care? For nearly all members of the Organization for Economic and Cooperative Development (OECD), the answer is guaranteed, high-quality, universal care at reasonable, affordable cost. For OECD founding member America, the answer seems to have become an opportunity to access care, which may or may not be of high-quality at indeterminate, wildly fluctuating and geographically varying cost. As you can see, in 1980, US spending was not much different from the other ten OECD countries in the study. While high, it was at least in the same universe. But now, at 50% more than Switzerland, our closest competitor in the “how much can we spend” sweepstakes”, we might be forgiven for asking, “What in the name of Hippocrates happened?” As if this weren’t enough, the 2014 GDP percentage of spend, 16.6%, has now risen to nearly 18%, according to the CMS. So, what do we get for all that money? We ought to have the highest life expectancy, the lowest infant mortality rate and the best health care outcomes in the entire OECD. But we don’t. 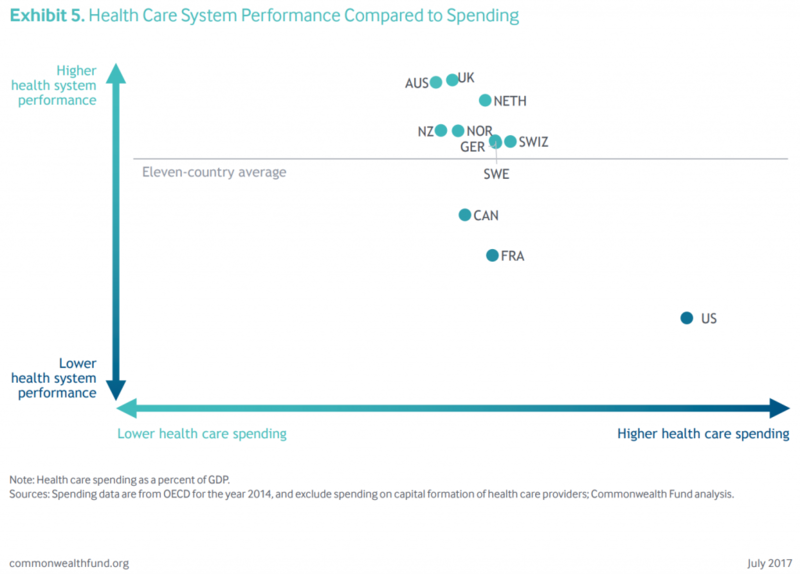 For many readers, it is probably galling to see both the UK and Australia at the top of the health care system performance measure and at the bottom of the spending measure. In the early 2000s, each of these countries poured a significant amount of money into improving its performance, and the results speak for themselves. Consider all of this mere background to the purpose of this blog post. Last week, we wrote about the terrible, 40-year stagnation of real wage growth in the US, pointing out that in that period real wages in 1982-1984 constant dollars have risen only 4.5%. But, as we have seen, health care spending did not follow that trajectory. This has resulted in tremendous hardship for families as they have tried to keep pace with rising health care costs. 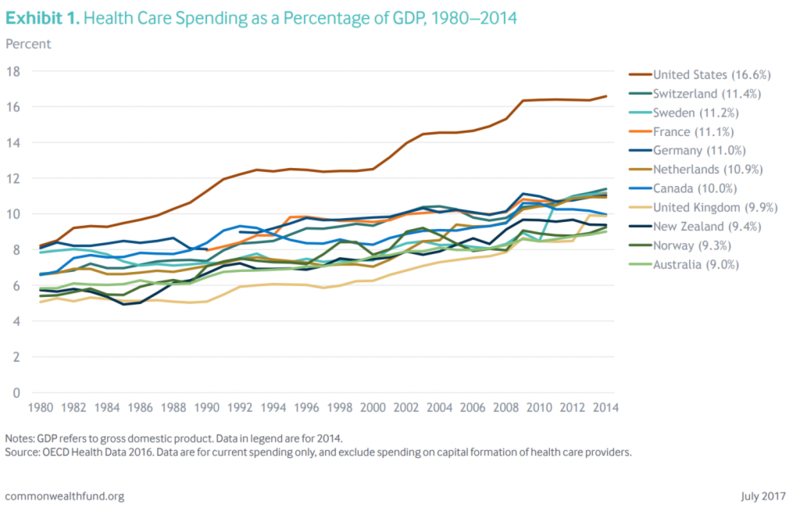 For, just as US health care spending has risen dramatically since 1980, so has what families have to pay for it. To put this in perspective, consider this. Since 1999 the US CPI has risen 54%, but, as the chart above shows, the cost of an employer offered family plan has risen 338%. If a family’s health care plan’s cost growth had been inflation-based, the total cost to employer and employee would be $8,898 in 2018, not $19,616. 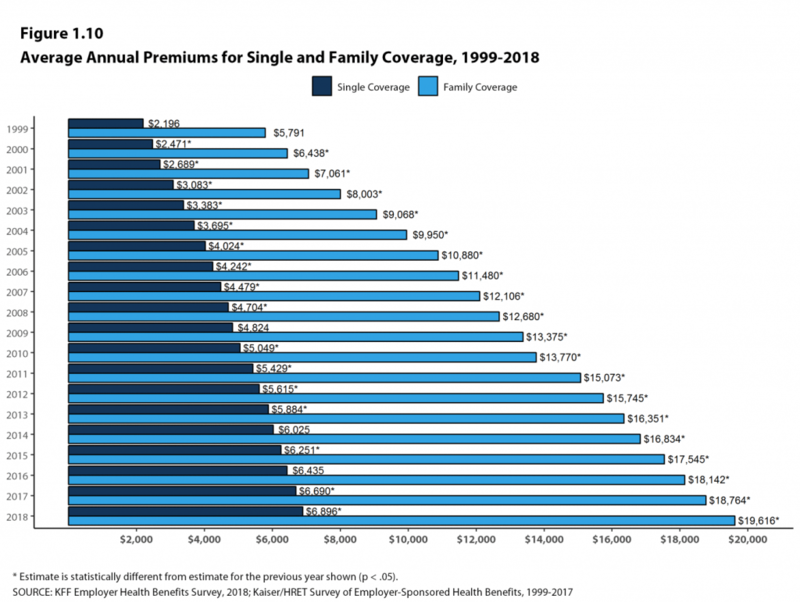 In 2018, the average family in an employer-based plan pays 30% of the plan’s cost ($6,850), plus a $2,000 deductible, plus co-pays that average $20 whenever health care is accessed, plus varying levels of co-pays for drugs. On top of all that is the enormous difficulty people have in trying to navigate the dizzying health care system (if you can call it that). American health care is a dense forest of bewildering complexity, a many-headed Hydra that would make Hesiod proud, a labyrinthine geography in which even Theseus with his ball of string would find himself lost. With wages and health care costs growing ever farther apart, America has a crisis of epic proportion. Yet all we can seem to do is shout at each other about it. When do you think that will end? When will we begin to answer the question that this post began with: What does a nation owe its citizens with respect to health care? When will our nation’s leaders realize we can actually learn from countries like Australia, the UK, Switzerland and all the other high performing, low cost members of the OECD? Continuing on the present course is no longer a viable option. Our data come from a variety of sources. One is comparative survey research. Since 1998, The Commonwealth Fund, in collaboration with international partners, has supported surveys of patients and primary care physicians in advanced countries, collecting information for a standardized set of metrics on health system performance. Other comparative data are drawn from the most recent reports of the Organization for Economic Cooperation and Development (OECD), the European Observatory on Health Systems and Policies, and the World Health Organization (WHO). This entry was posted on Tuesday, November 13th, 2018 at 6:08 pm	and is filed under health care, Research. You can follow any responses to this entry through the RSS 2.0 feed. Both comments and pings are currently closed.